Not to be confused with Detent. For other uses, see Détente (disambiguation). Détente (French pronunciation: ​[detɑ̃t], meaning "relaxation") is the easing of strained relations, especially in a political situation, through verbal communication. The term in diplomacy originates around 1912 when France and Germany tried, without success, to reduce tensions. The term is most often used in reference to a period of general easing of the geo-political tensions between the Soviet Union and the United States; it was the distinct lessening of the Cold War. It began in 1969, as a core element of the foreign policy of U.S. president Richard Nixon, in an effort to avoid the collision of nuclear risks. The Nixon administration promoted greater dialogue with the Soviet government, including regular summit meetings and negotiations over arms control and other bilateral agreements. Détente was known in Russian as разрядка (razryadka, loosely meaning "relaxation of tension"). The period was characterized by the signing of treaties such as SALT I and the Helsinki Accords. Another treaty, SALT II, was discussed but never ratified by the United States. There is still ongoing debate amongst historians as to how successful the détente period was in achieving peace. After the Cuban Missile Crisis of 1962, the two superpowers agreed to install a direct hotline between Washington D.C. and Moscow (the so-called red telephone), enabling leaders of both countries to quickly interact with each other in a time of urgency, and reduce the chances that future crises could escalate into an all-out war. The U.S./USSR détente was presented as an applied extension of that thinking. The SALT II pact of the late 1970s continued the work of the SALT I talks, ensuring further reduction in arms by the Soviets and by the U.S. The Helsinki Accords, in which the Soviets promised to grant free elections in Europe, has been called a major concession to ensure peace by the Soviets. Détente ended after the Soviet intervention in Afghanistan, which led to the United States boycott of the 1980 Olympics in Moscow. Ronald Reagan's election as president in 1980, based in large part on an anti-détente campaign, marked the close of détente and a return to Cold War tensions. In his first press conference, President Reagan said "Détente's been a one-way street that the Soviet Union has used to pursue its aims." Following this, relations turned increasingly sour with the unrest in Poland, end of the SALT II negotiations, and the NATO exercise in 1983 that brought the superpowers almost on the brink of nuclear war. The most obvious manifestation of détente was the series of summits held between the leaders of the two superpowers and the treaties that resulted from these meetings. In the early 1960s, before détente, the Partial Test Ban Treaty had been signed on 5 August 1963. Later in the decade, the Outer Space Treaty, in January 1967, and the Nuclear Non-Proliferation Treaty, July 1968, were two of the first building blocks of détente. These early treaties were signed all over the globe. The most important[according to whom?] treaties were not developed until the Nixon Administration came into office in 1969. The Political Consultative Committee of the Warsaw Pact sent an offer to the West,[who?] urging them to hold a summit on "security and cooperation in Europe". The West agreed and talks began towards actual limits in the nuclear capabilities of the two superpowers. This ultimately led to the signing of the SALT I treaty in 1972. This treaty limited each power's nuclear arsenals, though it was quickly rendered out-of-date as a result of the development of MIRVs. In the same year that SALT I was signed, the Biological Weapons Convention and the Anti-Ballistic Missile Treaty were also concluded. Talks on SALT II also began in 1972. Brezhnev however at the start of the period in his speeches to the Politburo, was intent on using the period of relaxed tensions to prepare for Soviet expansion in the 1980s. In 1975, the Conference on Security and Cooperation in Europe met and produced the Helsinki Accords, a wide-ranging series of agreements on economic, political, and human rights issues. The CSCE was initiated by the USSR, involving 35 states throughout Europe. Among other issues, one of the most prevalent and discussed after the conference was that of human rights violations in the Soviet Union. The Soviet Constitution directly violated the Declaration of Human Rights from the United Nations, and this issue became a prominent point of separation between the United States and the Soviet Union. The Carter administration had been supporting human rights groups inside the Soviet Union, and Leonid Brezhnev accused the administration of interference in other countries' internal affairs. This prompted intense discussion of whether or not other nations may interfere if basic human rights are being violated, such as freedom of speech and religion. The basic disagreement[according to whom?] in the philosophies of a democracy and a single-party was in a state that did not allow for reconciliation of this issue. Furthermore, the Soviets proceeded to defend their internal policies on human rights by attacking American support of countries like South Africa and Chile, which were known to violate many of the same human rights issues. In July of the same year, the Apollo–Soyuz Test Project became the first international space mission, wherein three American astronauts and two Soviet cosmonauts docked their spacecraft and conducted joint experiments. This mission had been preceded by five years of political negotiation and technical co-operation, including exchanges of U.S. and Soviet engineers between the two countries' space centers. Trade relations between the two blocs increased substantially during the era of détente. Most significant were the vast shipments of grain that were sent from the West to the Soviet Union each year, which helped make up for the failure of kolkhoz, Soviet collectivized agriculture. At the same time, the Jackson–Vanik amendment, signed into law by Gerald Ford on 3 January 1975, after a unanimous vote by both houses of the United States Congress, was designed to leverage trade relations between the U.S. and the USSR, making the United States' involvement dependent upon improvements of human rights within the Soviet Union, in particular allowing refuseniks to emigrate; it added to the Most Favoured Nation status a clause that provided that no countries resisting emigration could be awarded this status. This provided Jackson with a method of linking geopolitics to human rights. Nixon and his national security adviser, Henry Kissinger moved toward détente with the Soviet Union in the beginning of the 1970s. They had hopes that the Soviets would, in return, help the United States extricate or remove itself from Vietnam. People then started to notice the consciousness in which the American politics started to act with. 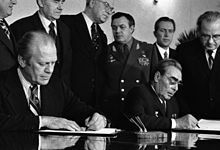 Nixon and Brezhnev signed an AMB treaty In Moscow on 26 May 1972 as well as an Interim Agreement (SALT I) temporarily capping the number of strategic arms. This was a show of détente militarily, the diffusion of multiplication of Nuclear Ballistic Arms started to occur. The linkage between strategic arms limitations and outstanding issues such as the Middle East, Berlin and, foremost, Vietnam thus became central to Nixon’s and Kissinger’s policy of détente. Through employment of linkage, they hoped to change the nature and course of U.S. foreign policy, including U.S. nuclear disarmament and arms control policy, and to separate them from those practiced by Nixon’s predecessors. They also intended, through linkage, to make U.S. arms control policy part of détente....His policy of linkage had in fact failed. It failed mainly because it was based on flawed assumptions and false premises, the foremost of which was that the Soviet Union wanted strategic arms limitation agreement much more than the United States did. A significant example of an event which contributed to the détente was the handshake that took place in space. 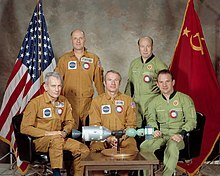 In July 1975, the first USSR-USA joint space flight was conducted and it was called the Apollo–Soyuz Test Project. The primary goal of this project was to create an international docking system in order to allow two different space crafts to join in orbit, this would have allowed the crews on board to collaborate on the exploration of space. This project marked the end of the Space Race that started in 1957 with the launch of Sputnik, therefore allowing the tensions between the US and the USSR to decrease significantly. As direct relations thawed, increased tensions continued between the superpowers through their surrogates, especially in the Third World. Conflicts in South Asia, and the Middle East in 1973, saw the Soviet and U.S. backing their respective surrogates with war material and diplomatic posturing. In Latin America, the United States continued to block any leftward electoral shifts in the region by supporting undemocratic right-wing military coups and brutal military dictatorships; during this period, there were also many communist or leftward guerrillas around the region, which were allegedly backed by the Soviets and Cuba. During much of the early détente period, the Vietnam War continued to rage. Neither side trusted the other fully and the potential for nuclear war remained constant. Each side continued to aim thousands of nuclear warheads atop intercontinental ballistic missiles (ICBMs) at each other's cities, maintain submarines with long-range nuclear weapon capability (submarine-launched ballistic missiles or SLBMs) in the world's oceans, keep hundreds of nuclear-armed aircraft on constant alert, and guard contentious borders in Korea and Europe with large ground forces. Espionage efforts remained a high priority as defectors, reconnaissance satellites, and signal intercepts measured intentions and attempted to gain strategic advantage. The Soviet invasion of Afghanistan In 1979 that was to shore up a struggling Pro-Soviet regime led to harsh criticisms in the capitalist west and a boycott of the 1980 Summer Olympics in Moscow. United States President Jimmy Carter boosted the U.S. defense budget and began financially aiding the President of Pakistan, General Muhammad Zia-ul-Haq, who would in turn subsidize the anti-Soviet Mujahideen fighters in the region. A contributing factor in the decline of Detente as a desirable American policy was the inter-service rivalry which existed between the American Departments of State and Defense. From 1973 to 1977 there were three Secretaries worth mentioning; Elliot Richardson, James Schlesinger, and Donald Rumsfeld. Schlesinger's time as Defense Secretary was plagued by notably poor relations with Henry Kissinger, one of the more prominent American advocates of Detente. Their poor working relationship bled into their professional relationship, and as a result an increasing number of policy clashes began to accrue. These clashes would inevitably result in Schlesinger's dismissal in 1975. However, his replacement, Donald Rumsfeld, shared Shlesinger's distaste for Kissinger. As a result, the clashes on policy between the State Department and the Defense Department continued. Rumsfeld thought that Kissinger was too complacent about growing Soviet strength. While Rumsfeld largely agreed with Kissinger's assessment that the United States possessed superior military strength when compared with the Soviet Union, he argued that Kissinger's public optimism would prevent Congress from giving the Department of Defense the funds which Rumsfeld believed were required to maintain the favorable gap between the US and the Soviets. In response, Rumsfeld regularly presented a more alarmist view of the superior strength of the Soviet superpower, which he credited with convincing Congress to increase military spending. 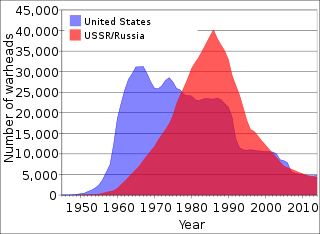 In response to the stranglehold of influence which Kissinger possessed in the Nixon and Ford Administrations and the subsequent decline in influence over foreign policy by the Department of Defense, Richardson, Schlesinger, and Rumsfeld used growing popular antipathy for the Soviet Union in the United States to undermine Kissinger's attempts to achieve a comprehensive arms reduction treaty and thereby portray the entire notion of Detente as an untenable policy. The 1980 American presidential election saw Ronald Reagan elected on a platform opposed to the concessions of détente. Negotiations on SALT II were abandoned as a result. However, during the later years of Reagan's presidency, he and Gorbachev pursued a policy that is considered Détente. Despite this, the Reagan administration talked about a "winnable" nuclear war, leading to the creation of the Strategic Defense Initiative and the Third World policy, funding irregular and paramilitary death squads in Central America, sub-Saharan Africa, Cambodia, and Afghanistan. Look up détente in Wiktionary, the free dictionary. ^ John F. V. Keiger (1983). France and the Origins of the First World War. pp. 69–70. ^ Silvio Pons and Robert Service, eds. Dictionary of 20th Century Communism (2010) pp 73, 274-78. ^ "The World Transformed, 1945 to the Present - Paperback - Michael H. Hunt - Oxford University Press". global.oup.com. Retrieved 10 April 2017. ^ "The Rise and Fall of Détente, Professor Branislav L. Slantchev, Department of Political Science, University of California – San Diego 2014" (PDF). Archived from the original (PDF) on 23 October 2014. Retrieved 22 July 2014. ^ Nuti, Leopoldo (11 November 2008). The Crisis of Détente in Europe. ISBN 9780203887165. Retrieved 22 July 2014. ^ "Ronald Reagan, radio broadcast on August 7th, 1978" (PDF). Retrieved 22 July 2014. ^ "Ronald Reagan. January 29, 1981 press conference". Presidency.ucsb.edu. 29 January 1981. Retrieved 22 July 2014. ^ "Detente Wanes as Soviets Quarantine Satellites from Polish Fever". Washington Post. 19 October 1980. ^ Simes, Dimitri K. (1980). "The Death of Detente?". International Security. 5 (1): 3–25. JSTOR 2538471. ^ "The Cold War Heats up – New Documents Reveal the "Able Archer" War Scare of 1983". 20 May 2013. ^ Gus W. Weiss. "videofact"
^ Lapennal. Human Rights, p. 1. ^ a b c Lapennal. Human Rights, p. 14–15. ^ David Tal, " 'Absolutes' and 'Stages' in the Making and Application of Nixon’s SALT Policy." Diplomatic History 37.5 (2013): 1090-1116, quoting pp 1091, 1092. Nixon himself later wrote, "[W]e decided to link progress in such areas of Soviet concern as strategic arms limitation and increased trade with progress in areas that were important to us -– Vietnam, the Mideast, and Berlin. This concept became known as linkage.” Richard Nixon (1978). RN: The Memoirs of Richard Nixon. p. 346. ^ "NASA - Handshake in Space". Nasa.gov. 1 March 2010. Retrieved 30 September 2018. ^ Morgan, Kellie (15 July 2015). "Celebrating historic handshake in space, 40 years later". CNN. Retrieved 30 September 2018. ^ "Reagan, Gorbachev two paths of Détente". Washington Post. Washington Post, 29 May 1988. 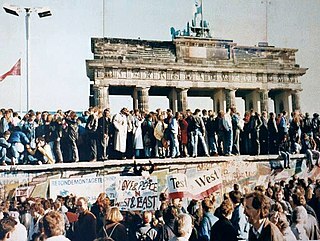 29 May 1988. ^ Norman Podhoretz (January 1984). "The First Term: The Reagan Road to Détente". Foreign Affairs (America and the World 1984). Daigle, Craig The Limits of Detente: The United States, the Soviet Union, and the Arab-Israeli Conflict, 1969–1973. Yale University Press (2012). Gaddis, John Lewis. The Cold War. The Penguin Press (2005). Lapennal, Ivo. Human Rights: Soviet Theory and Practice, Helsinki and International Law. Eastern Press (1977). Litwak, Robert S. Détente and the Nixon doctrine: American foreign policy and the pursuit of stability, 1969-1976 (Cambridge UP, 1986). McAdams, A. James McAdams. "East Germany and Detente" (Cambridge UP, 1985). Sarotte, M. E. Dealing with the Devil: East Germany, Détente and Ostpolitik, 1969–1973. University of North Carolina Press (2001). Henry Alfred Kissinger is an American elder statesman, political scientist, diplomat, and geopolitical consultant who served as United States Secretary of State and National Security Advisor under the presidential administrations of Richard Nixon and Gerald Ford. A Jewish refugee who fled Nazi Germany with his family in 1938, he became National Security Advisor in 1969 and U.S. Secretary of State in 1973. For his actions negotiating a ceasefire in Vietnam, Kissinger received the 1973 Nobel Peace Prize under controversial circumstances, with two members of the committee resigning in protest. Kissinger later sought, unsuccessfully, to return the prize after the ceasefire failed. The Strategic Arms Limitation Talks (SALT) were two rounds of bilateral conferences and corresponding international treaties involving the United States and the Soviet Union, the Cold War superpowers, on the issue of arms control. The two rounds of talks and agreements were SALT I and SALT II. The Helsinki Accords, Helsinki Final Act, or Helsinki Declaration was the final act of the Conference on Security and Co-operation in Europe held in Finlandia Hall of Helsinki, Finland, during July and August 1, 1975. Thirty-five states, including the US, Canada, and all European states except Albania and Andorra signed the declaration in an attempt to improve relations between the Communists and the West. The Helsinki Accords, however, were not binding as they did not have treaty status. This is a timeline of the main events of the Cold War, a state of political and military tension after World War II between powers in the Western Bloc and powers in the Eastern Bloc. Jack Foust Matlock Jr. is a former American ambassador, career Foreign Service Officer, a teacher, a historian, and a linguist. He was a specialist in Soviet affairs during some of the most tumultuous years of the Cold War, and served as U.S. Ambassador to the Soviet Union from 1987 to 1991. The relations between the United States of America and the Union of Soviet Socialist Republics (1922–1991) succeeded the previous relations from 1776 to 1917 and predate today's relations that began in 1992. Full diplomatic relations between the two countries were established late (1933) due to mutual hostility. During World War II, the two countries were briefly allies. At the end of the war, the first signs of post-war mistrust and hostility began to appear between the two countries, escalating into the Cold War; a period of tense hostile relations, with periods of détente. The Indo–Soviet Treaty of Peace, Friendship and Cooperation was a treaty signed between India and the Soviet Union in August 1971 that specified mutual strategic cooperation. The treaty was a significant deviation from India's previous position of non-alignment in the Cold War and in the prelude to the Bangladesh war, it was a key development in a situation of increasing Sino-American ties and American pressure. The treaty was later adopted to the Indo-Bangla Treaty of Friendship, Cooperation and Peace in 1972.